Medieval ship type popular in the eleventh through the thirteenth centuries and the Christian Crusaders’ transport of choice. Unlike the swift, more comfortable galleys that transported the wealthiest crusaders and pilgrims to the Holy Land, the round ship was ungainly and slow. Because of the need for large amounts of cargo space for retainers, equipment, and horses, it was, however, ideal. Round ships had a length-to-beam ratio of three or even two to one, giving them a round appearance and their name. Most were single-masted and square-rigged vessels. The cog of northern Europe was a typical round ship. Slow because of their hull shape, round ships had to await favorable winds before sailing from each port of call. However, the increase in carrying capacity made a slower passage economically feasible. In traveling to and from the Holy Land, round ships moved along the coasts, rarely venturing offshore. In their inevitable stops along the way, these ships opened up markets for the Italian merchants whose goods they carried. Over time these markets became regular trading ports for the maritime republics. The round ship began to disappear in the fifteenth century, replaced by the carrack and other ship designs. Bass, George F., ed. A History of Seafaring Based on Underwater Archaeology. London: Thames & Hudson, 1972. Landstrom, Björn. The Ship. Garden City, NY: Doubleday & Co., 1961. Lewis, Archibald R., and Timothy J. Runyan. European Naval and Maritime History, 300–1500. Bloomington: Indiana University Press, 1985. Unger, Richard W. The Ships in the Medieval Economy, 600–1600. Montreal, CA: McGill–Queen’s University Press. 1980. 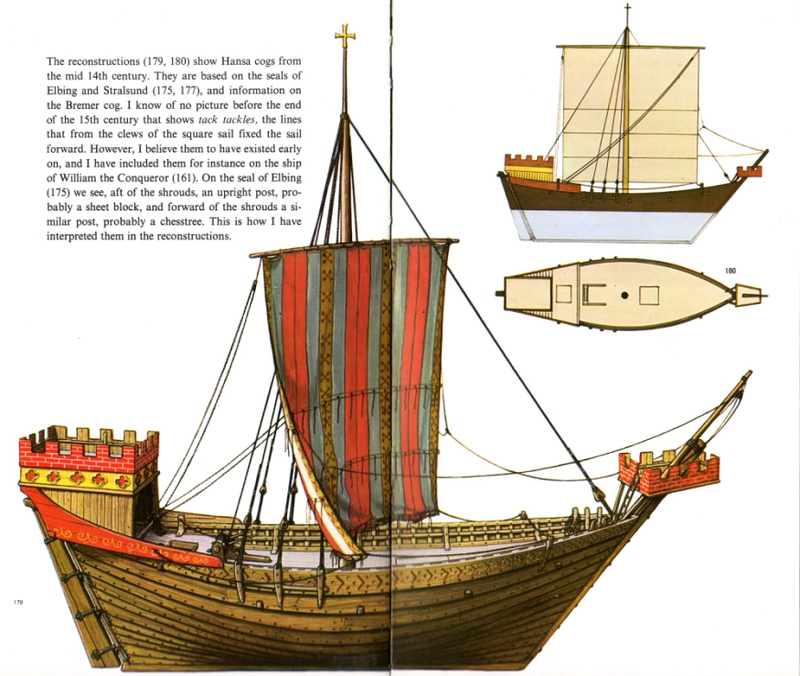 Medieval ship type, dominant in North Europe from the thirteenth to the fifteenth centuries. Creation of the Hanseatic League in 1241 brought about a massive increase in maritime trading activity in northern Europe. This prosperity stimulated shipbuilding and revolutionized design of the merchant ship and later the warship, as seen in the development of the Hansa cog. Its high speed and large cargo capacity made the cog the dominant merchant vessel of the North Sea for 200 years. 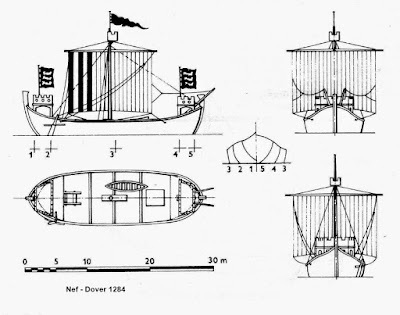 In general, the medieval development of vessels may be divided into two classes: the oared longship built for war and the round ship designed for trade. These two classes held true for centuries until the superiority of the sailing cog in warfare became so apparent that it became the all-around vessel of choice. The ability to use merchantmen as warships proved so advantageous that the concept survived the demise of the cog. In configuration, the cog resembled a medieval round ship. It was broad in beam, keeled, and clinker-built (in other words, the outer boards overlapped each other). It had a rounded bow and stern, and the rudder was located in the center of the stern. The cog had a square sail mounted amidships. Later versions displaced up to 600 tons and were up to 100′ in length, with two smaller masts fore and aft. By 1304 Denmark had converted its entire fleet of over 1,000 longships to cogs. In time, however, the cog gave way to more specialized carracks and galleons. Chatterton, E. Keble. History of the Sailing Ship. New York: Argosy-Antiquarian, 1968. Galuppini, Gino. Warships of the World. New York: Times Books, 1983. A fully rigged medieval sailing merchantman and warship. Developed in France, the nef had a broad beam, rounded ends, and a carvel-planked (flush rather than overlapping) hull. Similar in design and purpose to the cog, this type of ship was normally single masted with a more rounded stern than the cog. Fore and after castles were part of the hull structure. By the fifteenth and sixteenth centuries the vessel had grown to almost 400 tons and carried three masts. Its basic purpose as a naval vessel was to serve as a fighting platform. Bruce, Anthony, and William Cogar. An Encyclopedia of Naval History. New York: Facts on File, 1998. Two types of Viking vessels plied the northern seas, the knarr and the drakkar. The knarr was the oceangoing trading vessel supplanted by the Hansa cog. The drakkar was the Viking longship of lore and legend. It consisted of many rooms or spaces between deck beams used to house the oars. The largest of these raiding vessels were propelled by both sail and oar. The sail was mounted on a mast set amidships. Reconstructions of longships prove they were capable sailing vessels. They could not only run before the wind effectively, but they could run across the wind better than most square riggers. The best archaeological example of the longship is the Gokstad ship, a reconstruction of the longship displayed in an Oslo museum. Typical of Viking raiding vessels, she is 76′ long. Although the maximum size of these raiding vessels is still under debate, one, the Long Dragon, measured 140′ in length and could accommodate 34 rowers per side. Viking epics describe vessels up to twice this length, but there is as of yet no archaeological evidence of them. Casson, Lionel. Ships and Seafaring in Ancient Times. Austin: University of Texas Press, 1994. Challu, Paul B. Du. The Viking Age: The Early History, Manners, and Customs of the Ancestors of the English Speaking Nations. 2 vols. New York: Charles Scribner’s Sons, 1889. Wilson, David M. The Vikings and Their Origins. New York: A & W Publishers, 1980. A type of merchant ship, often armed, of the fourteenth to seventeenth centuries. The earliest carracks (circa 1367) were merchantmen of the Mediterranean type with a rounded stern in a carvel-built hull (the hull planks were flush rather than overlapping). Rigging included a mainmast and mizzenmast with a square sail on the main and a lateen sail on the mizzen. The square yard consisted of two lashed spars supported by topping lifts. A centerline ladder led to the round top of the mainmast. By 1500 the carrack had evolved into a larger vessel measuring 98 feet overall, 69 feet on the keel, with a breadth of 33 feet and a depth from the midships rail to the keel of just over 21 feet. The hull type now included a foremast and an extra mizzen, called the bonaventure mizzen, or bonaventure for short. Armament included from 18 to 56 guns. The hull form and rigging of the carrack varied greatly depending on locality and era. For example, carracks of northern Europe were more heavily timbered than those of the Mediterranean. The word “carrack” is believed to come from Arabic, and from Arabic to the Old French caraque with the same meaning. Blackburn, Graham. The Overlook Illustrated Dictionary of Nautical Terms. Woodstock, NY: Overlook Press, 1981. Kihlberg, Bengt, ed. The Lore of Ships. New York: Crescent Books, 1986. Landström, Björn. The Ship. Garden City, NY: Doubleday, 1961. Rogers, John G. Origins of Sea Terms. Boston: Nimrod Press, 1984. Long, narrow wooden vessel with a shallow beam and low freeboard. The galley was propelled by rows of oars and almost always sailed on one or two masts. In the early days a square sail was carried on a single mast, but in later years lateen sails on two masts were more common. Galleys varied widely, although this ship type was the predominant warship of the ancient Mediterranean world and thrived for almost 5,000 years. Galleys were in use on the Nile and Mediterranean as early as 3000 b.c. The Phoenicians borrowed the design, and it was then further refined by Greek naval architects. Originally galleys had a single bank of oars, and the ship was used both for transport and war. Homer makes reference to galleys in The Iliad. The war galley was effective because it could move quickly to an enemy vessel for boarding. In the eighth or ninth century b.c., the ram—a massive, pointed bronze projection set at the waterline—was introduced in war galleys. The ram could punch a hole in an opposing ship, sinking it. War galleys progressed throughout the centuries, becoming more powerful as modifications evolved. The single row of oarsmen soon gave way to two banks of oarsmen. This was known as a bireme. The change to three superimposed banks produced the trireme. Vessels of this variety won the 480 b.c. Battle of Salamis against the Persians. Originally each oar was pulled by one man, but later several men were put to one oar. Some galleys had four or five superimposed banks of oars; such ships carried crews of up to 500 men. By the first century a.d., however, the Romans had returned to the trireme as their main battle ship. During the sixteenth and seventeenth centuries, Genoa, Venice, and France maintained fleets powered by 25 three-man oars to a side and, later, five-man oars. Captives and convicts also came to row the ships. The usual practice until about 1450 had been to employ volunteers or hired mercenaries. Such ships might have a displacement of 200 tons and be approximately 164′ × 20′ in size. After cannons were introduced at sea, they found their way onto galleys. Cannons were mounted on a platform at the bow—usually one large gun and one or two on each side of it. Aiming the guns was accomplished by turning the vessel. Galleys were swift (up to 10 knots for short periods) and maneuverable. They were also not dependent on the wind, which was ideal in the Mediterranean, but they were vulnerable to adverse weather and unable to stay at sea for long periods because of their scant cargo capacity. The galley had a considerable effect on the naval history of the Mediterranean. Eventually it gave way to the “galleass,” which combined the freedom of movement of the galley with the seaworthiness and fighting power of the sailing warship. The Battle of Lepanto on 7 October 1571 established the importance of the galleass as a warship. The last use of galleys in Mediterranean fighting occurred in the 1717 Battle of Matapan. They were present in the 1718 Battle of Cape Passero, but took no part in the action. Galleys also appeared in the Baltic during the seventeenth and eighteenth centuries, and they were in use there as late as the Russo-Swedish War of 1809. A Russian galley built in 1791 carried sails on three masts, including a square-rigged main, and mounted 22 cannon. Anderson, Roger Charles. Oared Fighting Ships. London: Percival Marshall, 1962. Bamford, Paul. Fighting Ships and Prisons. Minneapolis: University of Minnesota Press, 1973. Cowburn, Philip. The Warship in History. New York: Macmillan, 1965. Guilmartin, John Francis, Jr. Gunpowder and Galleys: Changing Technology and Mediterranean Warfare at Sea in the Sixteenth Century. Cambridge, UK: Cambridge University Press, 1974. Rogers, William L. Greek and Roman Naval Warfare. Annapolis, MD: Naval Institute Press, 1937. ———. Naval Warfare under Oars. 4th to 16th Centuries. Annapolis, MD: Naval Institute Press, 1940. A galley with two banks of oars on each side. 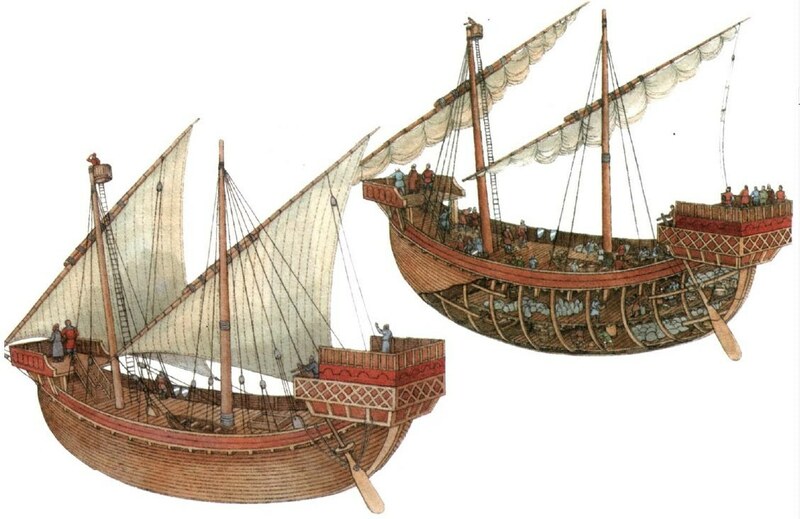 Originated by the ancient Romans, biremes were usually warships and as such were extensively employed by the Turks, Venetians, and other Mediterranean powers in the sixteenth century. Most ships of this type were fitted with a pointed metal ram, or beak, attached to the bow at or just below the waterline. The traditional tactic was to sink an enemy vessel by ramming it. War galleys had as many as three or even four men to each oar, and the banks of oars were on different levels, the upper-level oars being longer than the lower-level ones. Most vessels of this type were fitted with a single mast and sail that were unstepped and stowed during battle and when rowing to windward. Measuring about 80 feet in length with a 10-foot beam, biremes were faster than single-banked galleys but slower than triremes. Biremes were replaced by sailing warships in the mid-1600s. Kemp, Peter, ed. The Oxford Companion to Ships and the Sea. Oxford, UK: Oxford University Press, 1988. Wallinga, H. T. Ships and Seapower before the Great Persian War: The Ancestry of the Ancient Trireme. New York: E. J. Brill, 1993. Wedde, Michael. Towards a Hermeneutics of Aegean Bronze Age Ship Imagery. Mannheim: Bibliepolis, 2000. 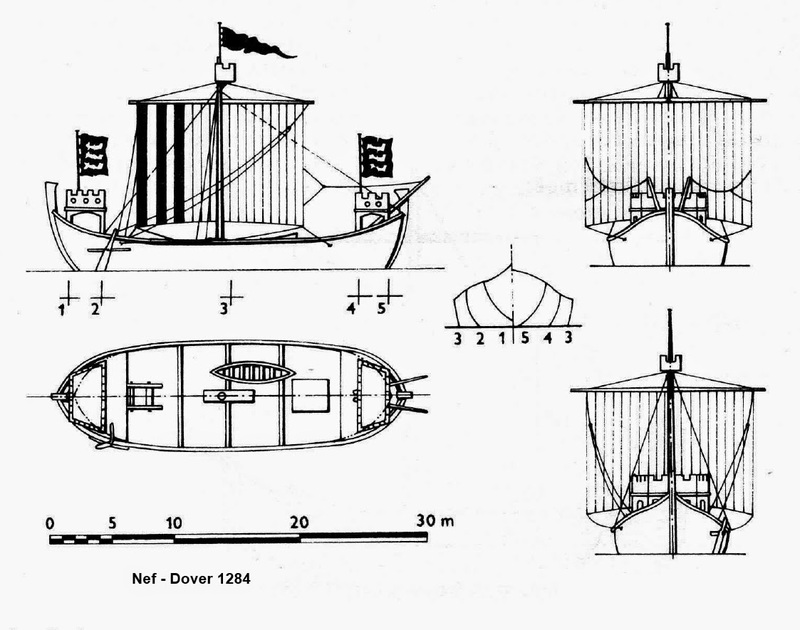 A Greek galley (later Roman) dating from the middle of the seventh century b.c., with three banks of oars, one above the other, used primarily as a ship-of-war. The 62 rowers in the upper bank were referred to as thranites and pulled 14-foot oars. There were 58 rowers in the middle bank, referred to as zygites, who pulled 10.5-foot oars, while 54 oarsmen in the lower bank, known as thalamites, pulled 7.5-foot oars. 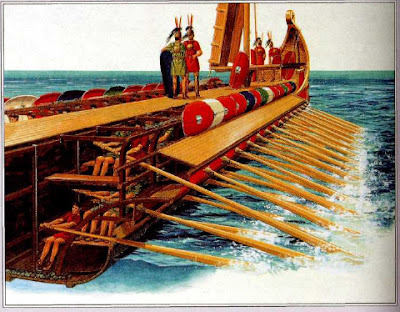 An additional 26 oarsmen, called perinoi, operated from the top deck, giving triremes a total complement of 200 rowers. Armed with a long, detachable ram, triremes frequently carried archers and soldiers for boarding enemy ships. They were capable of speeds in excess of 10 knots, albeit only for short periods of time, depending on the strength and stamina of the rowers. 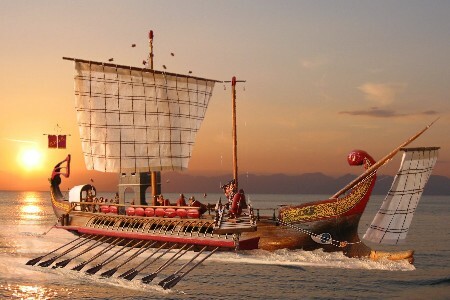 Triremes died out as warships around a.d. 1200 when they were rigged as sailing vessels with two masts and lateen sails, the oars being used only in battle to provide added mobility. Haws, Duncan, and Alex A. Hurst. The Maritime History of the World. Vol. 1. Brighton, UK: Teredo Books, 1985. Morrison, John S., John F. Coats, and N. Boris Rankov. 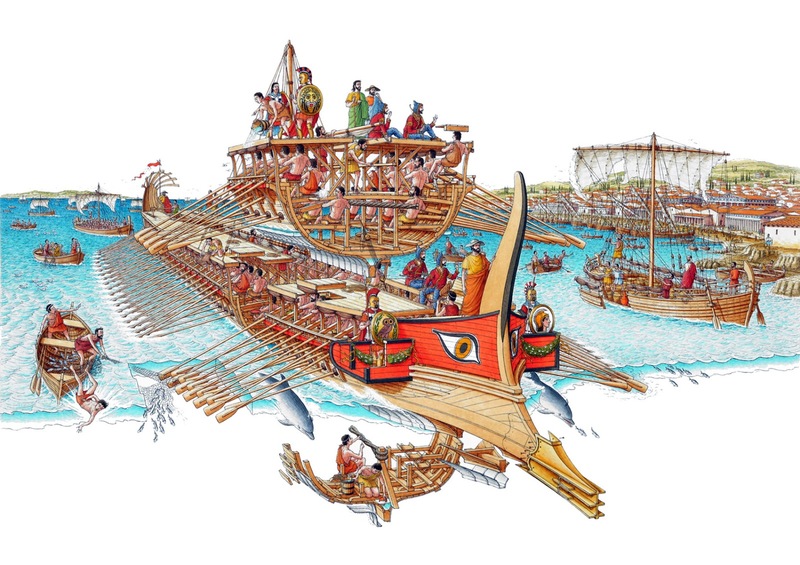 The Athenian Trireme: The History and Reconstruction of an Ancient Greek Warship. 2d ed. Cambridge, UK: Cambridge University Press, 2000.